This is the latest idea in junction design, and – bear with us – it kind of involves everyone switching sides of the road. 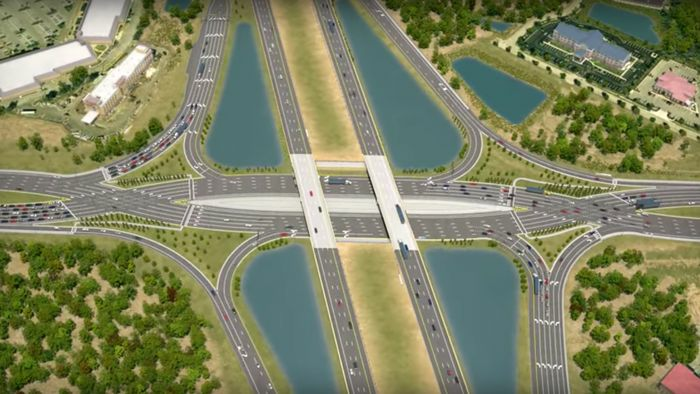 Originating in the US and called the diverging diamond interchange, this nightmarish-looking layout where five lanes of traffic cross each other – twice – is actually based on a simple concept: eliminating the left-hand turn (across traffic). It might look a bit like a huge Scalextric assembly or like America’s bonkers figure-of-eight racing has reached public roads, but when placed at a freeway interchange, like in the video example, the diverging diamond allows cars leaving the freeway to turn either left or right to join their new carriageway without having to cross any lanes of traffic flowing in the opposite direction. Driving on the right briefly becomes the opposite as the lanes drift over to the left-hand side in such a way as to allow traffic to get in lane and simply continue their flow. This reduces the number of traffic lights required, although measures will be needed to prevent queuing traffic blocking the points at which the two carriageways cross. 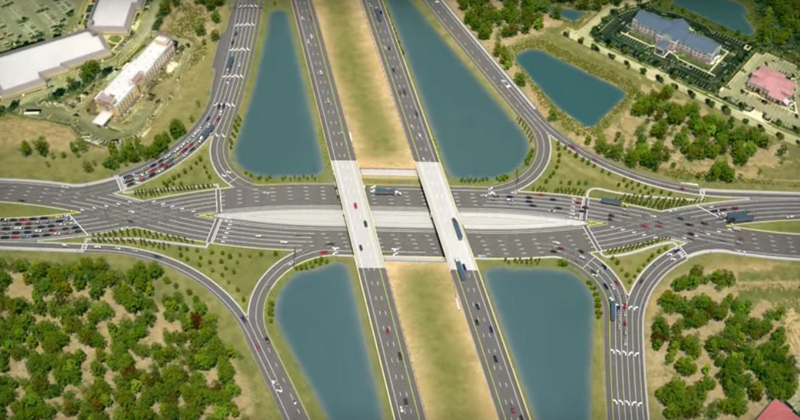 Research reportedly shows that this design of junction reduces the number of fatal crashes by 60 per cent. Overall crash numbers dip by a third. At an existing example in Florida, commuters are said to be experiencing a 40 per cent reduction in travel delays, but we don’t know whether that statement refers to the frequency of jams or their length. Left turns across traffic are a controversial topic in the US, with many safety advocates calling for their replacement with other solutions. UPS delivery drivers are banned from making them unless they’re unavoidable, apparently with huge benefits for route efficiency and fuel economy.